Introduction Thread: For NEW members (RECENTLY JOINED ONLY) to say hello. The Introduction Thread is for NEW members only that joined within 30 days or so of the current date. We have our forums, we have our staff, we have our history, and we have you. So come on in and introduce yourselves! This thread is a dedicated spot for people to introduce themselves who are new. It's a friendly place, so please be welcoming one and all. Have a question about how RangerBoard works; such as avatars, more info on rules, etiquette, etc? Feel free to ask in the Simple Q&As About RangerBoard thread! If you're having problems with a technical issue on RangerBoard, you can inquire about it and get advice on it in the RangerBoard Tech Support thread! Welcome to our very lovely community and please enjoy your stay! Last edited by Morgan Lamia; December 26th, 2016 at 04:40 AM. I'm not really sure what to say but I'm RangerNero, I'm 17 and I'm from Ireland. As well as loving Power Rangers, I really like Kamen Rider, and I'd like to get into Ultraman too. My favourite PR seasons are probably Time Force for Saban era and Ninja Storm for Disney. I tend to like Green or Blue rangers most. My favourite Kamen Rider series is probably Drive. I seem to be in the majority for prefering Shinnosuke himself to both Chase and Gou! On a non-toku note, I like music and drawing a lot. I especially love The Cure. But you've been pretty quiet. Just a heads up to everyone, this is meant for users who have registered within the last 30 days or so. Give or take. I can't help but feel this thread will go unused unless it's stickied. Who cares? This board only survives if we say stuff, so if everyone feared their versing, it would be empty and boring. Express yo'self! Just a heads up to everyone, this is meant for users who have registered within the last 30 days or so. Are the rest of us allowed to say hi back? Hi everyone, My name is Adam. I live in Pennsylvania. I just joined the board after my curiosity got the better of me about making a suit. I watched MMPR and a few of the sequel series after that. Always a fan of the Green Ranger, even though he wasn't around very long. This looks to be a very knowledgeable place for everything Power Ranger related. I will start combing through the vast information that is provided. So, hello everyone. Thanks for letting me be a part of this. And now to start all the fun and exciting research! I just joined the RangerBoard community and wanted to take the opportunity to introduce myself. My name is Aaron and I go by AJ_West_ on Twitter and RangerBoard. I originally became an MMPR fan back in 1993. That was when I was age 10 so I was right in my main toy/collecting phase. I was big into season 1-3 of MMPR and the original MMPR movie in 1995. I was originally a classic red ranger fan but when the green ranger came and eventually the white ranger I found myself a huge Tommy fan. By 1995 I was turning 12 and starting to fade away from playing with toys. 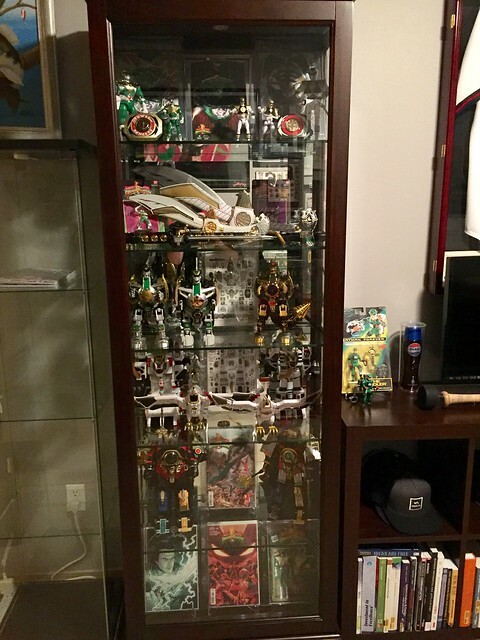 The MMPR toys I had back then was the Dino Megazord, Dragonzord, Morpher, Dragon Dagger, White Saba Sword and Falconzord (had some other small figures and flip-head figures too). I kept all these toys but roughly around 2008 I sold all of them (except Dino Megazord) to buy an iMac computer. I was also an avid baseball/basketball card collector in my youth. After finishing college in my late 20’s, getting a real job and buying a house (growing up finally) I had an urge to get back into collecting. I originally started getting back into baseball/basketball cards in 2015 but found myself unfulfilled with the state of the hobby. It was around December 2015 when I found myself in a Toys-R-Us randomly and saw the Legacy White Saba Sword and Legacy Dragon Dagger. The nostalgia of MMPR instantly hit me and the quality of these new Legacy items instantly hooked me. 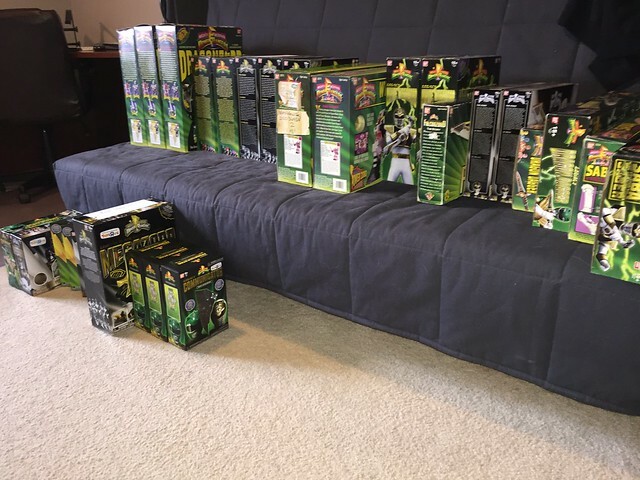 It was right then and there I got back into collecting MMPR toys again. 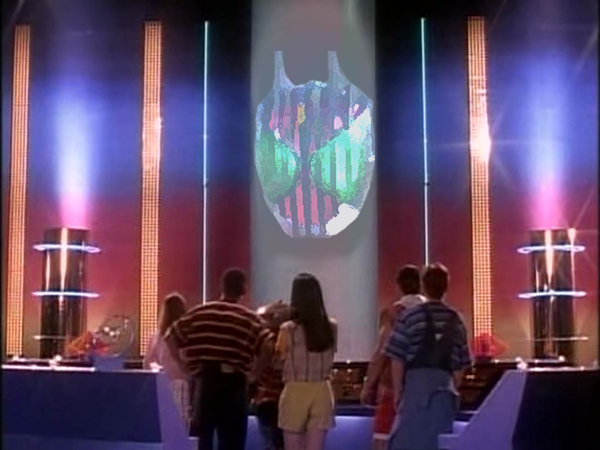 I can’t imagine a better time to be a Power Rangers fan then now. Between the vintage MMPR toys, Legacy line and comic books I have found a hobby and fandom that fulfills my collecting passion! I’m big into opening my toys and displaying them but also collecting mint in sealed boxes as well. I find the art on the boxes incredible and actually just got back some graded MMPR items from AFA. 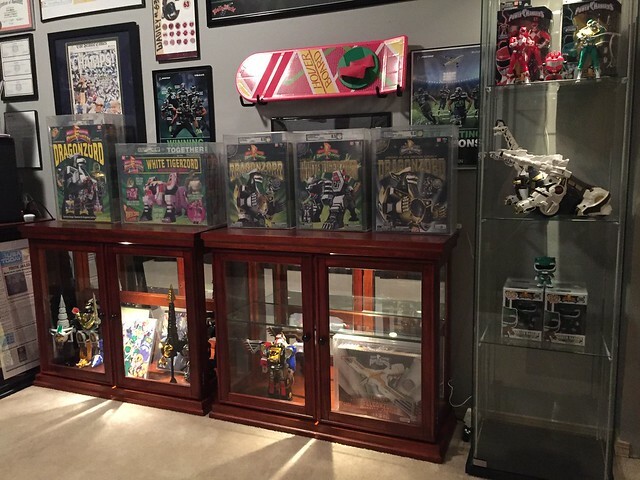 A goal of mine is to put together a high quality video showcasing my collection and fandom for MMPR. Anyhow, I will post a couple photos of my collection and I look forward to participating in these forums. My Wife and I are big Power Ranger fans and we finally decided to get into cosplay so we pieced together a pink ranger costume for her and a Aniki 2014 version green ranger costume for myself. My Wife's suit, belt, holster and under hood was purchased through Halu and we ordered her boots, gloves and cuffs through Aniki. Helmet and morpher was bought through Matthew Wilson, Legacy blaster was purchased on eBay. I can't say how excited we are just too bad we won't see our costumes for a while. We hope to have our costumes in before the new movie hits. Hi everyone!! Just signed up about a week ago. I'm John and I'm officially hooked on the cosplay idea lol. I haven't been to a comic con event yet but my wife and I are planning to attend a few of them next year. I just purchased a full 2014 version green ranger costume from Aniki and I put together a full pink ranger costume for my wife. We are both very excited to enter the e cosplay world haha. You're flipping people off in your intro? Hi everyone. My name is Alexis, I'm 28 and honestly, I joined because I wanted to discuss about the silver belts on the legacy wave 2 figures. I'm doing fine, thanks for asking and welcome to the board! I hope it becomes your new favorite hangout. Lol, Thanks for the welcome! Thanks! SO far enjoying this community! I am new to Ranger Board, I was in my teens when rangers first came out and started getting back into it a couple of years ago. My favorite rangers tends to be the blue and black rangers. However I do have a few exceptions, Rhino Ranger, Koragg ( villain) and Shadow Ranger. Really looking forwards to reading comments and opinions on the Power Rangers. Last edited by K9 Ranger; November 6th, 2016 at 06:03 PM. I do have a few exceptions, Rhino Ranger, Koragg ( villain) and Shadow Ranger. Happy to have you here, don't be a stranger.